Fashion portal Jabong has introduced a new section, called The Juice. I was curious to find out what it is and below is what I could figure out. 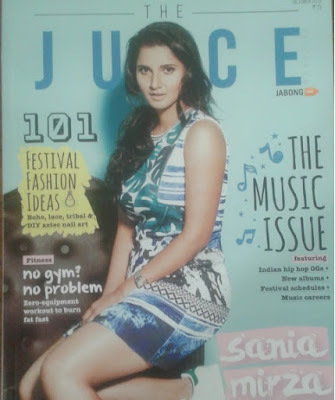 The juice from Jabong is a fashion magazine and helps you stay up to date with fashion trends. Apparently the bi-monthly magazine was launched last April, but I didn't notice it till now. I could some nice articles online- stories on Sania Mirza and her game, tips to look like a celeb,tips to pick perfect jeans, must have accessories for men and so on. Before deciding your shopping items, browsing through the Juice section of Jabong is highly recommended. You might get some real useful tips.